One of the benefits of a blog tour is that you don't have to leave home (or change out of your comfortable clothes) right? But recently, when my family and I took a long-awaited trip to visit old friends in Ashland, Oregon, I actually got to meet reviewer Marya Jansen-Gruber, the editor of Through the Looking Glass Children's Book Review in person at her lovely home in Ashland. It was just a coincidence that after she'd agreed to review my book on her website, I discovered she lived in Ashland. So I got to go on vacation, meet a wonderful children's book reviewer, personally hand her a copy of my new book, and wear comfortable clothes all at the same time. That's the kind of blog tour I can go for! You can read Marya's review of A VAMPIRE IS COMING TO DINNER! at http://www.lookingglassreview.com/books/current/board-and-novelty. ...the rewards are sometimes beyond what even you can imagine. Last week I received an email from a graduate student in Texas. "I'm a 25-year old grad student," she wrote, "my parents are selling the house I grew up in, and I've been asked to 'clean out' all my childhood books to give away...I came across my worn copy of your book Just Plain Penny and started reading it again immediately. Right away, memories of a long, hot summer spent reading that book over and over came to me. 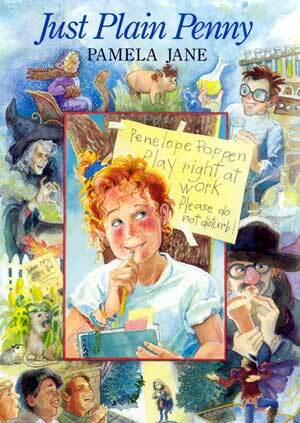 I remember how much I loved to pretend to be Penny and wished I had bright red hair and freckles. What's more - I realized I still love the book and plan to keep it...I just wanted to write and say how much I still enjoy our book - almost 20 years after I first received it!" We had just moved to a farm in Bucks County, Pennsylvania, the summer I began Just Plain Penny. The view outside my writing room window was one I had dreamed of since I was a child living in suburban Detroit, longings I invested my fictional character with. "In the distance," Penny imagined, "fields of ripening corn and alfalfa would cover the hills with a patchwork of gold and green." I loved writing Just Plain Penny but I never dreamed that somewhere in Texas a little girl would spend the summer reading and rereading the book. Even further from my thoughts was the possibility that 20 years later, the book would still hold meaning for her. "Every year during the holidays I am reminded of Noelle of the Nutcracker," she wrote. 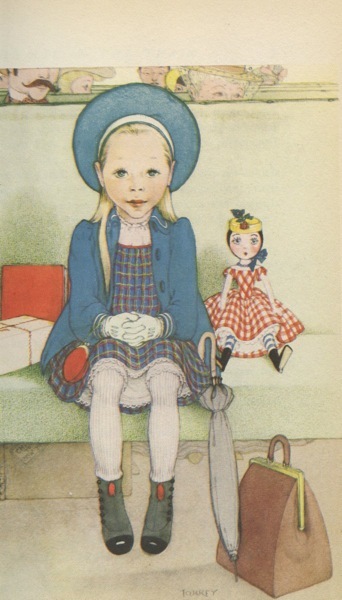 "I make some hot tea, pull out my copy of the book and read it with a big smile on my face...as a young girl growing up poor in Indiana, I dreamed of being a ballerina, oh, and of having my dolls talk to me! Now that I think of it, the fact that I became a film producer and find great joy in bringing other people's creations to life probably is somewhat routed in the lessons I learned from you." Who could imagine that the books we write from our own dreams, fantasies, and realities could transform the lives of children, who in turn grow up and touch the lives of others? As my friend and fellow author, Kay Winters says, "Way leads on to way." The recent rains in Rhode Island flooded the basement of a friend of mine who lives there. Somehow she managed to escape the surging waters, overflowing streams, and flooded roads surrounding her farm, and drive down to visit me in Pennsylvania. When I asked her if she wanted to go out to dinner, she said, "No, let's just stay home and laugh about my basement." My friend wasn't being facetious. She just has the ability to laugh at things that don't go her way. I guess that's why I like to laugh at rejections. It's good therapy in a tough world, and some of them really are funny. You can read about my funniest rejections, but last night I got to thinking up more. I once had twelve picture book manuscripts rejected in one hour, by telephone. That's an average of one rejection every five minutes – an all-time record! I've had manuscripts accepted in three days and others after 125 submissions. 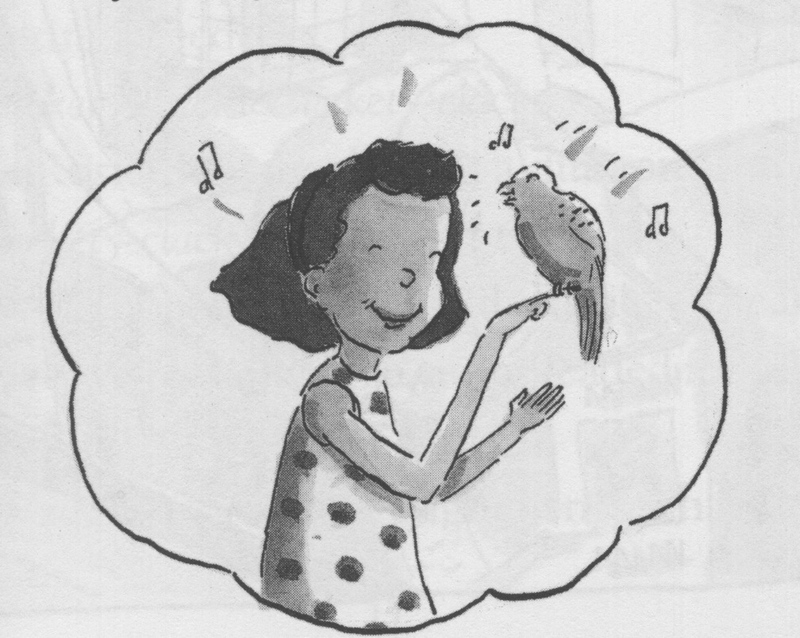 When I wrote a chapter book about my parakeet, Winky Blue, my editor at the time told me it was too slight for a book, and would make a better magazine article. But Mondo Publishing accepted it, and then asked for five more. What is your funniest or most entertaining rejection? Please leave a comment and tell us about it! Then hopefully you'll soon be smiling about an acceptance. School visits can be many things – exhilarating and inspiring come to mind. But they are, above all, just plain fun. It's not only that you, the author, get the opportunity to share so much of your life and creative process with your readers, but that they share so much with you – their projects, dreams, plans, hopes and disappointments. Even, as in the case of a recent visit to Don Gill Elementary School in Wellsboro, Pennsylvania – a cake for one of your characters, Winky Blue, the lovable but mischievous parakeet in my six-book series published by Mondo Publishing. 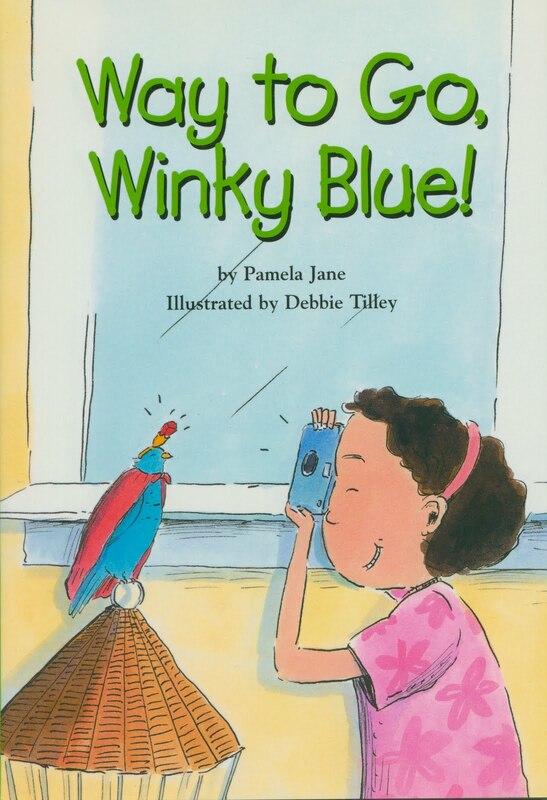 To read all about my Winky Blue books, visit my website. Every Christmas my father bought me a first edition Oz book for a dollar, from the Silver Shack, a used bookstore in downtown Detroit. 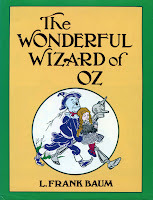 The Oz books were the highlight of my Christmas, the key to a land of unimaginable excitement. I can close my eyes now and breathe the yellowed, slightly musty smell of those books, with their promise of magic and adventure. The Wonderful Wizard of Oz was the first in the series by L. Frank Baum, but Dorothy wasn’t the only child to find her way to Oz. In later books, children arrived from all over the U.S. I fully intended to make it there myself before I became an adult. I wasn’t sure exactly how it would happen, but I had faith that it would. "You will never hear anything more about Oz, because we are now cut off forever from all the rest of the world. But Toto and I will always love you and all the other children who love us. Dorothy Gale." I stopped chewing mid-bite. I didn’t move or even breathe as the enormity of what I had just read sunk in. The whole universe seemed to stand still with those terrible final words – "we are now cut off forever from all the rest of the world." I was locked out of fairyland forever, stuck in the real world trying to coerce ordinary life into a story. I must have known Oz was fiction. I was nine years old, after all. But a part of me believed that the fairyland existed on some plane, and that I would get there before I reached adulthood. Other kids had made it – Betsy from Oklahoma, Button Bright from Philadelphia, Trot from California. Surely there was room for one more kid to squeeze in before the door to Oz was slammed shut forever. The way Oz was cut off, Baum explained in The Emerald City of Oz, was by making it invisible to outsiders. That was the chink in the wall, the crack in the door left ever so slightly ajar. Oz might be invisible to most people, but if you looked really really closely, you could glimpse it shimmering through the fabric of reality, a parallel universe to the ordinary world we lived in. You might not be able to live there, but by watching closely and paying attention, you could at least catch sight of it now and then. 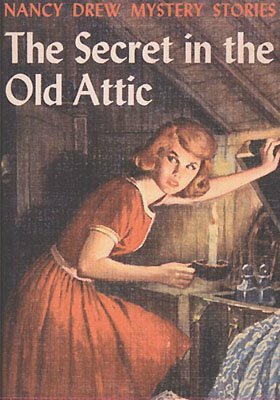 Our imaginations were shaped by the great classics of our time, such as The Clue of the Broken Locket, in which Nancy Drew, detective, won the respect of her distinguished father and the admiration of the local police with her quick wittedness and courage. My friends and I combed the neighborhood in search of a clue that would lead to a hair-raising mystery – a scrap of paper, a footprint, a rusty key. But nothing panned out. Then one night, a car slowed down on our street (there had recently been a kidnapping in a neighboring town). Quickly and resourcefully, I jotted down the license number. Then the mysterious automobile sped away! We waited for the next episode to unfold, but nothing happened. There was no second chapter, no subsequent clue. The entire story line collapsed. Stories in books were more satisfying than life with its disappointments and dead ends. Nancy Drew never discovered a clue that led nowhere and she never had to face having the entire plotline collapse around her. I wonder how resourceful and quick-witted she’d have been then? For some reason I had never read the Betsy-Tacy high school stories. But now, twenty-four years later, I submerged myself in Betsy's high school world, the one I wish had been mine. Family, friends, heartaches and crushes – it was all so innocent and fun, the perfect escape from the loneliness of New York. But I couldn't locate the last book in the series, Betsy's Wedding. Betsy’s life, so vividly evoked, was incomplete and unfinished without the last book. I had to have it. The bookstore said the book was out of stock. The publisher said it was out of print. Finally I found it in the Staten Island branch New York Public Library. I immediately called and reserved it. But I couldn't bear to wait for the machinery of the New York Public Library system to grind into motion. I would take the ferry to Staten Island and get the book myself. On a gray, misty Saturday in early March, I made the trip, watching impatiently as the ferry plowed through the cold, choppy waters. Couldn't the engines go any faster? What if someone else took out my Betsy book first? What if the Staten Island branch burned down before I got there? When we finally docked, I ran all the way to the library. I didn't open the book until I was on the ferry again, headed back across the bay. Even then I hesitated, holding the book tightly in my lap. Betsy's Wedding was the last in the series. 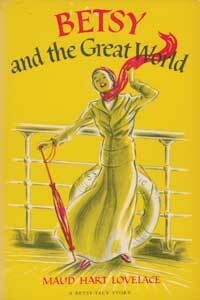 When I finished it, there would be no more new Betsy-Tacy adventures to discover. But at last, sitting on the hard ferry bench, my face wet with foam, I began reading.